Chocolate Orange Flavour: Protein Blend (Milk Protein Isolate, Hydrolysed Gelatine, Whey Protein Concentrate (Milk), SOJA Protein Isolate), Dark Chocolate Couverture (13%) (Sugar, Cocoa Mass, Cocoa Butter, Emulsifier (SOJA Lecithin), Flavouring), Humectant (Glycerine), Orange Fudge Style Icing (11%) (Sugar, Palm Oil, Glucose Syrup, Water, Skimmed Milk Powder, Natural Orange Flavour, Salt, Emulsifier (E472c), Preservative (E202), Thickener (E401), Colours (E160a, E120), Fructo-Oligosaccharide, Creapure® (Creatine Monohydrate), Partially Inverted Sugar Syrup, L-Glutamine, Fat Reduced Cocoa Powder, Flavourings, L-Leucine, Sunflower Oil, Antioxidant (Mixed E306 Tocopherol-rich Extract). 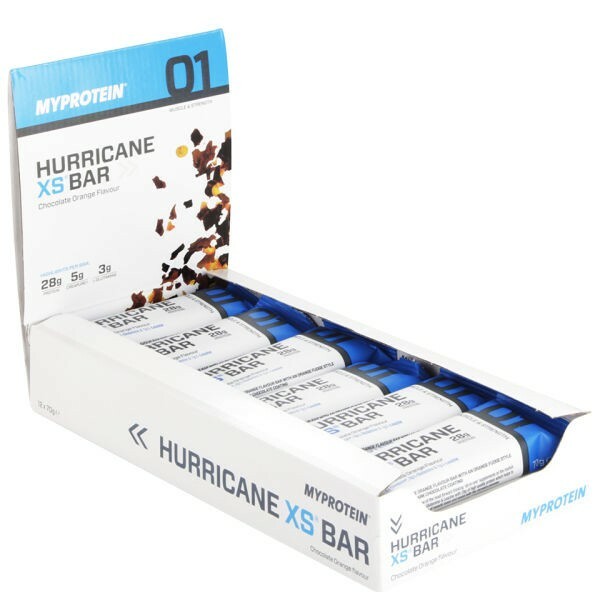 Hurricane XS is the ultimate all-in-one supplement containing a number of essential ingredients to help optimise muscle recovery. All these key ingredients have been added to one great tasting protein bar to provide a convenient but effective recovery supplement. 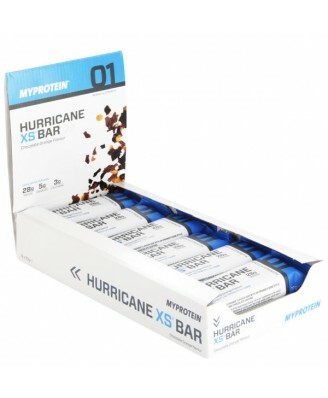 Each 70g bar provides up to 28g of premium protein with only 23g of carbohydrates (depending on flavour). The added 5g of creatine monohydrate (Creapure) will increase physical performance in successive bursts of short-term, high intensity exercise.